Automatic OneDrive backup is available, you just need to enable it from the settings. Microsoft gives you 15GB for free plus 3GB for the each device on which you turn on the automatic OneDrive camera upload. Unfortunately, the Music app doesn't support FLAC playback. Equalizer options are available from Settings -> Audio. You can either user presets or customize your own. Dolby Virtual Surround and Dolby Dialog Enhancer (in movies) are available, too. The video player supports XviD, DivX, MOV and MP4 videos up to 1080p resolution. The few things it won't play are MKV files and videos using the AC3 audio codec. There is a limited subtitles support. There's an FM radio with RDS support on board the Lumia 830. You can use the loudspeaker for the FM radio, though you still need the headset connected as it doubles as an antenna. The Nokia Lumia 830 shares the majority of its audio hardware with the Lumia 735 or at least that's what the closely matched output makes us believe. The smartphone scores excellently when plugged into an active external amplifier mixing clean output and high volume levels - higher than all of its non-HTC rivals in fact. 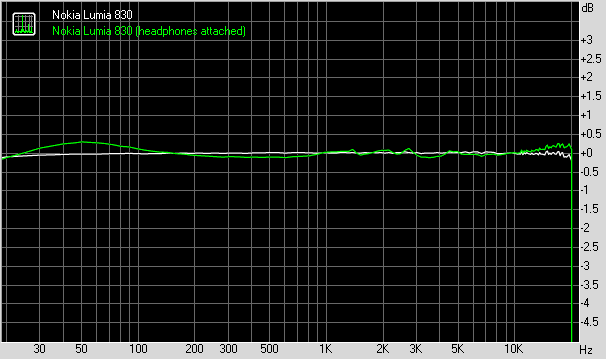 Plugging in a pair of headphones does cause a spike in stereo crosstalk, while the frequency response worsens a bit but still remains very good. Volume levels drop a bit too but again remain above average. 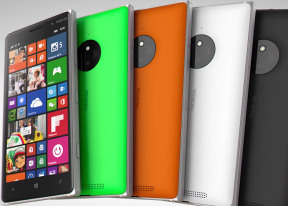 A very good overall showing by the mid-range Lumia 830 here.